The movie Coming to America was a comedy romance story of an African Prince who came to America in disguise in search of his future wife of his equal. Starring comedians Eddie Murphy and Arsenio Hall, I though it was very entertaining with a happy ending. A real life coming to America happened at the peak of several historical global events, and it involved a young woman from Evanston, who while at Howard University, met her prince and together began a movement. Born in Evanston, Illinois on November 20, 1906 to Joseph and Dora Hadley, Dorothy attended Foster School and Evanston Township High School. She later attended, graduated from and found employment at Howard University as secretary to the budget director. Born 1900 in Ethiopia to Grazmac Bayyan and Waysaro Dästa, Malaky Bayen was the second cousin to Haili Salasi. As part of an initiative to build better relationships with American Blacks, he and two other peers left for the United States to expand their education. After attending several universities, Malaku finished medicine at Howard University. It was at Howard where Malaku formally annulled his engagement to a daughter of the Ethiopian Foreign Minister and met his future wife, Dorothy, as she handed him his registration card. Dorothy and Malaku were married, 1931 in Fairfax, Virginia. In 1933, the couple welcomed their son, Malaku Bayen, Jr.
As you know, our fault and our weakness has been in the fact that we will not unite. As the movement grew, activities led to the formation of the Ethiopian World Federation, Incorporated in 1937. The original founders were Goulbourne M. Blackett, Matthew E. Gardner and Dorothy H. Bayen, Aida Bastian, Edora Paris, Warren Harrigan and Louis Paul. Dr. Lorenzo H. King, pastor of St. Mark’s Methodist Church in Harlem, was elected as the first president of the organization. After a nearly a year long battle with illness, Dr. Bayen passed away on May 4, 1940. However, to this day, both the Voice of Ethiopia (in new formats and media), and The Ethiopian World Federation continues its work. The Federation has since become an important factor in the Rastafarian movement. Dorothy Bayen relocated to Washington D.C. with her son Malaku Jr. (also known as Chip). Dorothy Bayen passed away on April 7, 1988. 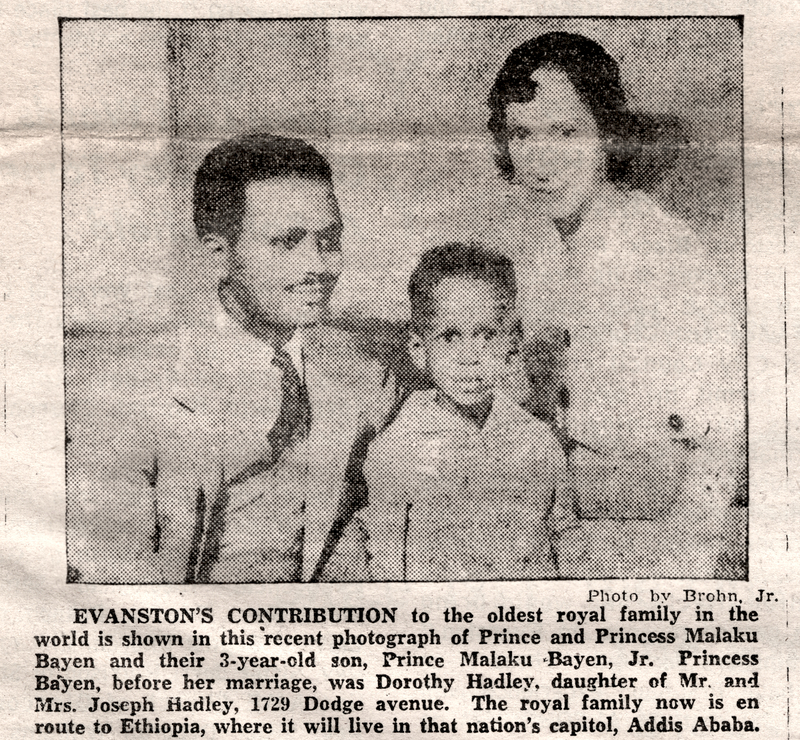 As titled in a 1931 News-Index paper, “An Evanstonian in Ethiopia as Wife of Native Prince”, Dorothy was more than a wife and mother. Dorothy H. Bayen helped a movement take root un the United States and played her part in world humanitarian movements. Sources: Encyclopaedia Aethiopica: He-N page 691. Yale University Library Manuscripts and Archives, The Dorothy Hadley Bayen Papers, 1931-47. Note: In research, I found two spellings, Melaku and Malaku. From personal letters, Malaku was consistent. There were variations of spelling of the last name as well. Beyan and Bayen. 6/10/14 – “‘Melaku Beyan’ is how Ethiopians pronounce and spell the full name of the remarkable Dr. Melaku”—Tewodros Abebe, Senior Archivist, Moorland-Spingarn Research Center, Howard University. Amazing! thank for this amazing story. As someone who has done quite a bit of research on the legacy of Dr. Malaku Bayen, I believe much has not be written about in regards to his wife Dorothy. The Ethiopian community will be grateful for what you have contributed. Thank you. And we are still looking for more information on Dorothy. The movement that the Ethiopian community created is an important time in history. i like to make a documentary film about Dr.Mealku Beyan and Dorothy could you tell me where to meet there decedents .